Welcome to The Abso!ute Sound online! We explore music and the reproduction of music in the home. We believe that the sound of music, unamplified, occurring in a real space is a philosophic absolute against which we may judge the performance of devices designed to reproduce music. Our goal is to provide the resources consumers need to judge how a component's sound either honors or departs from the music's truth, and to make sound purchasing decisions that maximize their experience of reproduced sound. Below is our Issue 158, January 2006 table of contents and editorial. 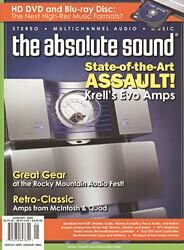 Anthony H. Cordesman listens to Krell's statement gear - starting at a cool $90k. Jonathan Valin, Chris Martens, and Robert Harley report on North America's premier high-end audio event. Chris Martens checks out a neutral multichannel music system from England's KEF. Jim Hannon reviews two turntables - Music Hall's MMF 2.1LE and Thorens' TD 190-1 - and the affordable Bellari VP129 tube phono preamp. Monitor Audio updates its Silver Series. Chris Martens and Sallie Reynolds listen to the flagship RS8, with a CM sidebar on the RS6. Three new items from Cyrus deliver good things in small packages, says Jim Hannon. A report by Chris Martens on what may be a new benchmark in affordable excellence. Vintage retro-classics from McIntosh and Quad, by Paul Seydor. Robert E. Greene goes about getting the bass right with the TacT corner-woofer system. Neil Gader on a classic small monitor reinvented for a 10th anniversary. Mr. Greene again, this time on one company�s new way with a very old driver technology. In his quest for musical multichannel controllers, Alan Taffel checks out the latest from Theta Digital. Music, music, music (and a few surprises for the reviewer). Updating the Super Disc List; Super Discs Redux, and two more surprises. Two new disc formats may finally deliver high-res digital audio - and end the CD, SACD, and DVD-Audio debate. Robert Harley reports. One audiophile's comparative shopping experience, by Barry Willis. Derek Bailey's Carpal Tunnel, Herbie Hancock's Possibilities, Marty Ehrlich's News on the Rail, plus a pair of new Tommy Dorsey sets, a Dylan van der Schyff SACD, and two new Acoustic Sounds 45rpm LPs. 2005's Best Rock and Pop Box Sets, plus 16 more CDs and LPs reviewed, including the latest from Wilco, Fiona Apple, Richard Hawley, Franz Ferdinand, Bonnie Raitt, Wynnona, Ali Farka Toure, Tim O'Brien, Atmosphere, And Silver Jews. EMI's big-budget Triastan und Isolde, Ren�e Fleming's Sacred Songs, two projects from Giden Kremer, Roger Waters' �a Ira SACD, and the full scoop on four other new CDs. Audiophiles Anonymous, by Wayne Garcia.